Panavia Tornado GR.1 ZD966/I of 2 Sqn. RAF 1993. This last role was not taken up but the RAF went one step further and developed the Air Defense Variant (ADV) now called the Tornado F.3. The Tornado is the RAF’s first variable-geometry aircraft. Built by a consortium from Britain, Germany and Italy known as Panavia with its head quarters in Munich, Germany. The first British assembled aircraft flew from Warton in Lancashire on 30 October 1974. The first production GR1 flew on 10 July 1979. A total of 228 GR1’s were built for the RAF, 36 of these were dual control and designated GR1(T). The three countries that contributed to the project manufactured different sections of the aircraft. Britain made the nose and rear fuselage; Italy made the wings and Germany the centre fuselage. The Rolls Royce designed engines were built by Turbo-Union; these were the RB-199 turbofans. Originally the MRCA (Multi Role Combat Aircraft) as it was known was to be a NATO aircraft, with countries such as Canada, Belgium and The Netherlands expected to contribute, but these countries elected to go for US built, cheaper, single seaters instead. The RAF first employed the Tornado at the TTTE (Tri-National Tornado Training Establishment) at Cottesmore in July 1980. As its name suggests this unit was to train aircrew from all three nations to use both the aircraft and its systems. This unit was followed in August 1981 by the TWCU (Tactical Weapons Conversion Unit) based at Honiton. The Tornado superseded the Buccaneer, Jaguar and Vulcan in the bomber and maritime strike roles. A vast amount of weaponry can be carried by the Tornado including 500-Kiloton nuclear bombs, BL755 cluster bombs, 1,000 lb. HE bombs, laser-guided bombs and anti-radiation missiles. Tornadoes are currently being converted to GR.4 standard; this will include new equipment such at TIALD, FLIR and a new navigational sub-system. MRCA Original designation for Tornado programme, meaning Multi-Role Combat Aircraft. Tornado prototypes Initial development batch of 9 aircraft. Tornado pre-series Follow-on development batch of 6 aircraft. Tornado IDS Generic term for ‘bomber’ version. IDS = Interdictor/Strike. 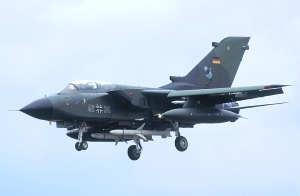 Tornado ADV Generic term for dedicated interceptor fighter version. Described separately. Tornado GR.Mk 1 Standard strike version of the Tornado IDS for the RAF. Features additional fin fuel tank and laser rangefinder in undernose fairing. Tornado GR.Mk 1(T) Version of the Tornado GR.1 with full flying controls in both cockpits for pilot training. 50 a/c + 1 pre-series refurbished. Tornado GR.Mk 1A Dedicated reconnaissance version of GR.1. Includes Vinten 4000 infra-red linescan video system in blister fairing below the aircraft nose. 14 a/c new build + 16 conversions. Tornado GR.Mk 1B Dedicated anti-shiping version of GR.1. Equipped to launch Sea Eagle missiles and carry ‘buddy’ in-flight refuelling pods. Tornado GR.Mk 4 Mid-Life Update for GR.1 with upgraded avionics and cockpit systems. Tornado GR.Mk 4A Mid-Life Update applied to GR.1A version. Tornado GR.4B Mid-Life Update applied to GR.1B version. Tornado IDS Germany Version of Tornado IDS for Germany. Features different weapons ejector racks and weapons fit. 212 a/c for Luftwaffe (including 2 refurbished pre-series and 50 dual control). 112 a/c for Navy. Tornado IDS Italy Version of Tornado IDS for the Italian Air Force. Very similar to German version. 100 a/c (including 1 refurbished pre-series and 12 dual-control). Tornado IDS Saudi Export version of Tornado IDS for the Royal Saudi Air Force. Very similar to RAF GR.1 version. 96 a/c (including 14 dual-control aircraft and 6 reconnaissance versions similar to GR.1A). Tornado ECR Version of Tornado IDS dedicated to reconnaissance and enemy air defence suppression. ECR = Electronic Combat and Reconnaissance. Only Tornados with RB.199 Mk 105 engines. 35 a/c new-build for Germany, 16 a/c conversions for Italy. 26 March 1969 Panavia consortium formed to handle multi-government contractual aspects. 1 June 1969 Turbo Union Ltd consortium formed to design, develop and produce the MRCA engine. 14th August 1974 First flight in Germany of MRCA first prototype (P01). 10 July 1979 First flight of initial production GR.Mk1 (ZA319). July 1980 Tri-National Tornado Training Establishment (TTTE) formed at RAF Cottesmore. 6 January 1982 9 Squadron RAF took delivery of its first aircraft (ZA586). 1983 First deliveries of Italian aircraft. 1986 First deliveries of Saudi aircraft. 18 August 1988 First flight of converted Tornado ECR prototype. 21 May 1990 First Tornado ECR delivered to the Luftwaffe. 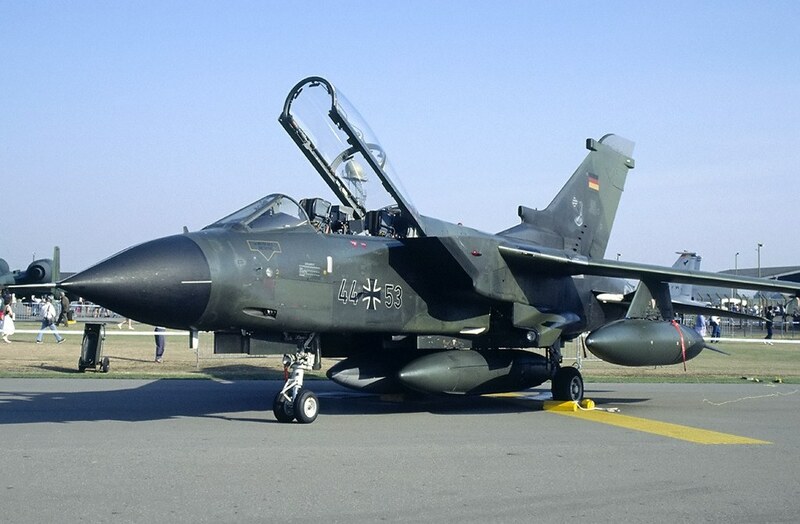 1993 Delivery of last production Tornado aircraft (F.Mk 3). 31 October 1997 Delivery of first upgraded GR.4 aircraft to the RAF. Armament: Two 27mm Mauser cannon with 180 rounds per gun plus a warload of 19,841 lb (9,000 kg) on three fuselage and four underwing hardpoints. These weapons may include one 500 kts nuclear weapon, eight 1,000 lb (454 kg) bombs, two airfield/runway denial weapons with multiple munitions, Paveway laser-guided bombs, two AIM-9 Sidewinder SRAAMs or up to seven ALARMs. Additionally the GR.1B carries two Sea Eagle missiles. Head of Design Team: ? * 1 a/c later refurbished to full production standard. * Later refurbished to full production standard. * Good detailed history of the Tornado. * Pictorial history of the Tornado. * Comprehensive up-to-date history of the Tornado. * Includes ‘Focus Aircraft’ feature on the Tornado. * Includes ‘Variant Briefing’ feature on the Tornado IDS. * Includes ‘Operators’ feature on the Tornado. * Highly illustrated modellers guide including scale drawings. Published by Lotnictwo Wojskowe, Poland, 2004 ISBN: ? * Polish-text modellers guide including scale drawings. * Modern documentary on the Tornado. * Another documentary on the Tornado.